Arlington, Texas - WBC heavyweight champion Deontay Wilder (40-0-1, 39 KO’s) was a very popular figure last weekend in Texas as he was mobbed by countless fans at the Errol Spence-Mikey Garcia pay-per-view event, which took place in front of cover 47,000 people at AT&T Stadium. This past Tuesday, Wilder announced his May 18th return at the Barclays Center in Brooklyn, with Showtime televising the bout. The selected opponent is WBC mandatory challenger Dominic Breazale (20-1, 18 KO’s). Wilder was on a collision course with Tyson Fury (27-0-1, 19 KO’s). Fury signed with Top Rank and aligned himself with ESPN - who wanted the British fighter to delay the rematch for the time being. But a few days before his big announcement was made, Wilder sat ringside and watched Spence dominate four division world champion Garcia over twelve rounds. All three judges scored every round in the fight for Spence. 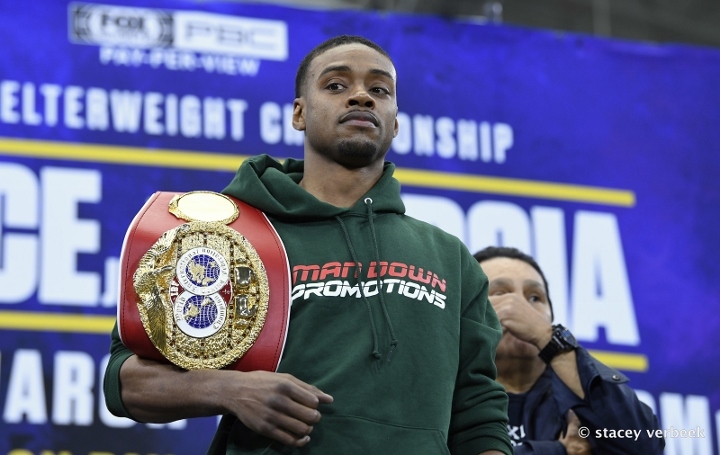 After the fight was over, Spence called out eight division champion Manny Pacquiao - who also attended the event and entered the ring to accept Spence's challenge. In terms of Spence being the best in the division, Wilder says that remains to be seen. “He still has a ways to go, we’ll see. I love Pacquiao and love for what he’s done for the sport but I think it’s about the younger guys in the sport like a Spence," Wilder said. While Pacquiao is being pushed as a potential opponent, Spence is more likely to face WBC champion Shawn Porter in a unification. [QUOTE=Input1914;19610117]Wilder's opinion has as much value as mine - zero! [/QUOTE] You don't think the opinion of a professional boxer on professional boxing has any value?